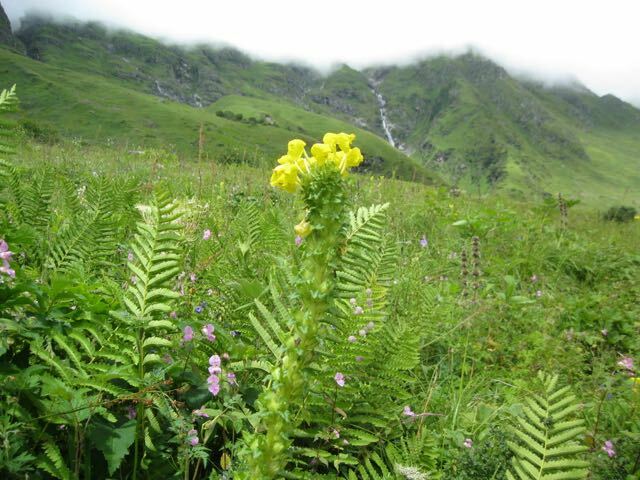 Valley of Flowers – The Drive to Paradise - Ghumakkar - Inspiring travel experiences. It was the dream of a few decades. 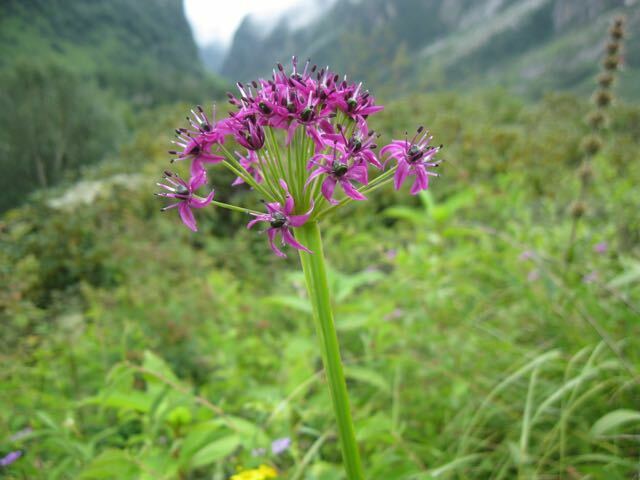 A valley full of flowers up in the Himalayas is not something to be missed. However, owing to the time required to undertake this trip in a limited window it got postponed year after year. You have only a 3-month window – July, August and September – and you need at least 7 days if travelling out of Delhi. However I took the decision last year to make a definite plan for this year. Started looking for accommodation at the beginning of the year; surprised to see GMVN was already booked and so went for another one. Convincing the usual teammates to opt out (as I knew most won’t make it considering the physical efforts involved) a team of 7 was constituted and arrangements made accordingly. The slot in mid-August was decided upon taking into account factors like best time at the valley, monsoon & landslides, Kawad (a religious procession) timing etc. The plan was to drive up to Govindghat via Kotdwara, Pauri and Srinagar (Uttarakhand) instead of the normal Rishikesh-Devaprayag route which is more landslide-prone. 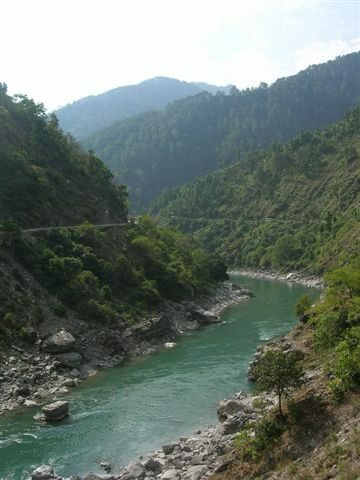 In the meanwhile visited Khirsu – a place close to Pauri town – over a weekend for a feel of the route. Though narrower, leaner traffic and good surface tilted the scale heavily for this passage. Other preparations too started months in advance. Though familiar with hiking, trekking is a tougher game especially as most of us are ‘over the hill’. Daily brisk walks in the neighbourhood park, selection of proper footwear, clothes (as the hills are known to be wet for long periods) including woollens etc. were done. A visit to Delhi’s Khari Baoli for dry fruits and a few other knick-knacks completed the picture. So we set out – on an overcast Sunday afternoon, 12 August 2018 – the first halt being at Kotdwara after a six-hour drive via Upper Ganga Canal road. Reached the pre-booked hotel around half-past seven in a light drizzle, had dinner and retired for the day to make an early start the following morning. The drizzle continued through the night and was still on when we made our move the next morning around six. Soon the ascent began and the falling raindrops gave the hills a surreal look. 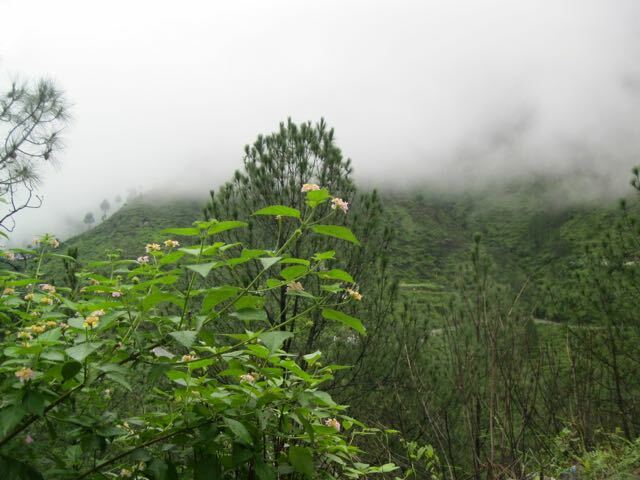 Pine forests were shrouded in mist and clouds were hovering over our heads. The lush green hills wore the look of a bride coming out to meet the groom, excited to be with you. The weather was just perfect for driving. We reached Srinagar after crossing Pauri and joined the Badrinath highway coming from Rishikesh. Monsoon being off season traffic wasn’t heavy and the going was good. Barring a few places where rocks kept rolling down to the road and below – with warnings, thankfully – the drive was uneventful. The drizzle relented by mid-morning and the sun shone bright making Alaknanda giggle through its muddy waters and the trees glistening. 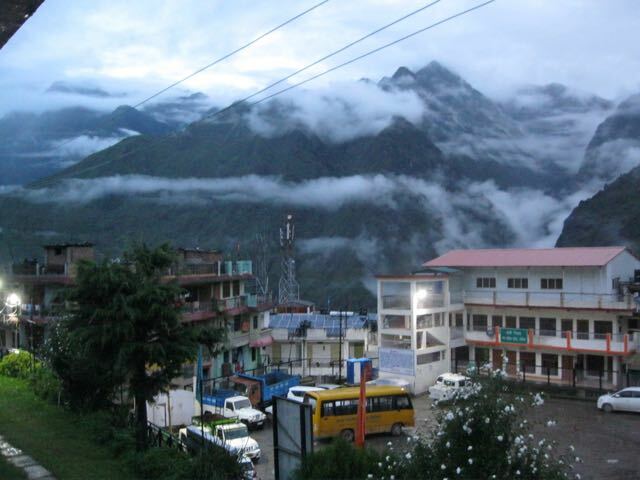 We reached Joshimath by six and found rooms at GMVN rest house. Out of the GMVN/KMVN guest houses I found this to be the best so far. The staff informed us that all their rest houses will be redone soon. 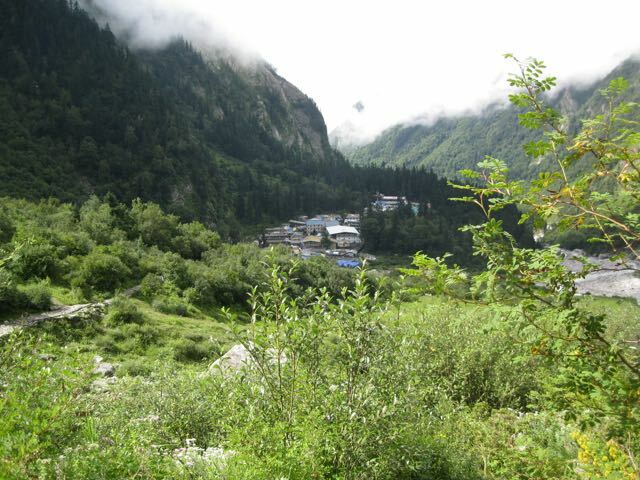 The 20 km drive up to Govindghat was exciting as it was via narrow valleys with high mountains fortifying both sides. The gurgling river kept company most of the way. Road was cut into the mountainside so the rock face was hanging over our heads. We moved away from the Badrinath highway at Govindghat, parked the vehicles and hired a local taxi to Pulna which is further 4 km up. The trek starts from here. You may get poncho and walking stick here – not the fancy ones, just the basic variety. Hired two ponies for the luggage and horsemen were given chits for the hotel with the number of bags which they’ll be delivering in about 3 hours. Chopper services are available from Govindghat up to the base camp at Ghangaria; one may opt to ride a pony as well. We decided to trek the 10 km. The stench was overwhelming; this, nevertheless, was inevitable with the number of ponies around. You require them to carry your luggage and for some to ride on. The path was well laid but the incline was steep so progress was slow. Facilities to sit and relax have been provided all along the way and it was extremely helpful. Lots of snack-shops as well. We need to cross a river midway over a makeshift bridge. Another bridge is under construction, should be done in a few months. Sikh pilgrims are aplenty. They would even encourage you to push on. Forest cover, rivers, greenery with no pollution – you will be enthralled by the pristine beauty around and help you forget the fatigue holding you back. I made it to Ghangaria – our base camp for the next three days – in 5 hours. Barring a few km, the trek was strenuous. Still young, old and not so fit people were doing it successfully. To me it was a milestone crossed as I never was on foot for so long. My teammates took about 9 hours to do the same but all made it to the hotel in one piece in spite of issues with depleted oxygen levels. This town, placed right under the gaze of a mighty mountain, comprises a few hotels, some shops and a gurudwara and is alive for about 4 months an year. All establishments close down in October and people move down to warmer areas. From Pulna the same trail lead you all the way up to Hemkunt bifurcating to valley of flowers right after Ghangaria. The gurudwara comes alive around 4.30 in the morning when batches of pilgrims make their preparations for the trek to Hemkunt Sahib. Our hotel had a masseur employed to take care of the tired soles which was indeed a blessing without which we wouldn’t have been able to walk each morning. 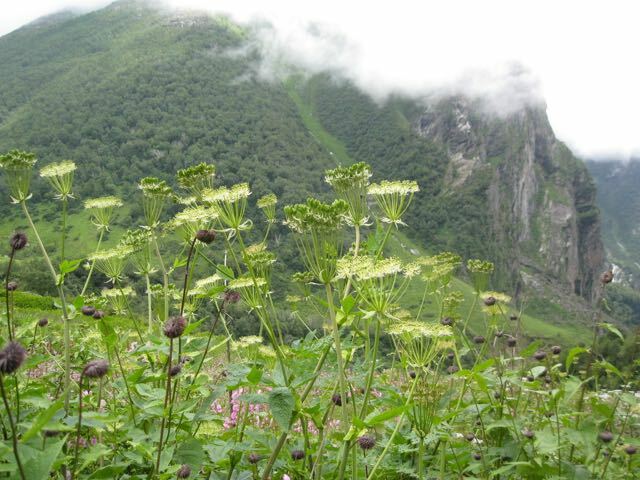 The next day was dedicated to the valley of flowers. Off we went with some essentials in the backpack, found the entrance to the valley half-an-hour from the hotel, gave our details for the ticket and moved on. A few minutes into the valley I felt I reached Jurassic park minus the vehicle. Down we went to the river with white water rushing over the boulders making a deafening sound and the mountain going straight up whose top is engulfed in white clouds. I imagined I was coming down in a chopper just as in the movie! We crossed the river and began the steep ascent up the mountainside and into a forest. It went up and up most of the time but levelled out at the top. The path was strewn with granite pieces but no mortar applied to keep the natural look. Lots of boulders by the side of the path to take a break and catch your breath. Little flowers of various hues smile at you from the wayside. The river is now way down in the gorge. You are almost at level with the top of the mountain you met at the crossing point, across the gorge. The vista to your front and right is breathtakingly beautiful. One moment everything was shining bright but gone in a wink as clouds move in and obscure your vision. I felt like Moses on Mount Sinai, about to meet God. The trail went on and on and we crossed a couple of brooks coming down all the way up from the mountains. I could see the whole mountainside covered in pink. There are other colours as well but pink was predominant. We have already covered over 3 km, seen lot of colours, blue skies, floating clouds but still something was missing. Is this all, I wondered. The answer came soon enough. Crossed another brook, took a turn and there you are – the inscription. Next 6 km is THE valley! Tired but super excited, we moved on. Huge swathes of flowers running up the hillside as far as one can see and down to the river. No roses or chrysanthemum but all wild beauties. Pink still was overwhelming but many other hues for which my male brain refused to assign a name – Lilac? Electric blue? Solid yellow? Leave it. Just enjoy the once-in-a-lifetime abundance. The next board I saw snapped me into reality. The single trail runs the entire length of the valley and I’m in the middle. 3 km further up is the end and another trail running down to Legge’s grave is 700 meters. It was already past one and I need to make the return journey by two O’clock in order to reach the gates by 5. I decided to go down to the grave and then relax for some time instead of rushing the next 3 km, before turning back. 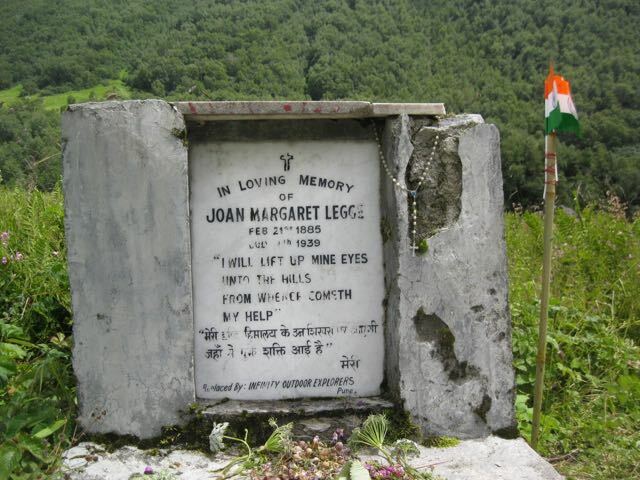 Joan Legge, a British botanist who slipped to her death while collecting samples is buried here. Back from the grave I found a boulder and sat down. Had water and looked around. The valley is in the form of a gigantic tray with mountains going up on all sides. Total privacy for the gods and goddesses to dance around as the locals believed. A breeze started flowing in. I closed my eyes. Then it hit me and hit me hard. The unmistakable fragrance of wild flowers. It’s all around and I inhaled deeply a few times. Almost intoxicating. No wonder it says people even fainted with the smell. In my hurry to see everything and photograph I failed to relax and enjoy so tried to make up. Watched colourful bumblebees flying from one flower to the other enjoying the nectar and I wished to become one. The sky took a deeper shade of blue. Such abundance of nature. Truly a piece of paradise. Unwilling to leave I dragged myself up and trudged on. Another day on feet. Came back to the hotel, massage, dinner and crashed. Next morning set out even earlier as the climb to Hemkunt is 6 km straight up and I made it in as many hours. Most of my teammates dropped out and lazed around. We climbed the other side of the lofty mountain we saw at the river crossing the previous day. The gurudwara was about to be closed by the time we reached there. Thick clouds were descending on it and temperature was falling as well. 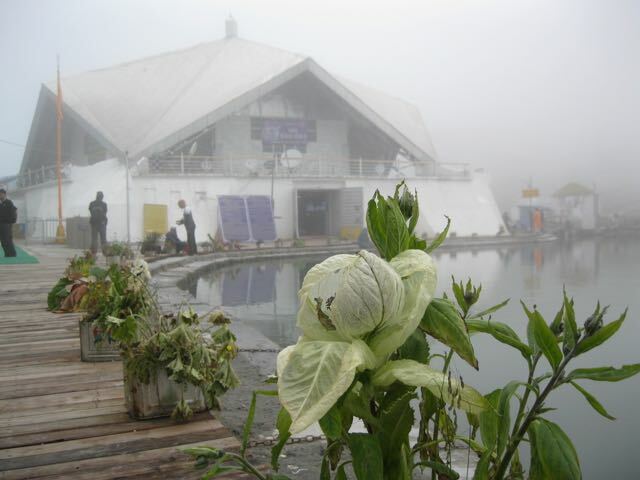 We made our rounds, clicked some snaps of brahmkamal (a flower found only at that height), had langar (free food – tea and porridge) and climbed down. By evening my calf muscles felt like jelly and in excruciating pain. However, the masseur made sure we were in a position to undertake the walk back to Pulna the following morning. We were back at Pulna in about 4 hours. Going downhill is a lot easier. Found a taxi to reach Govindghat, got into our vehicles in the parking lot. 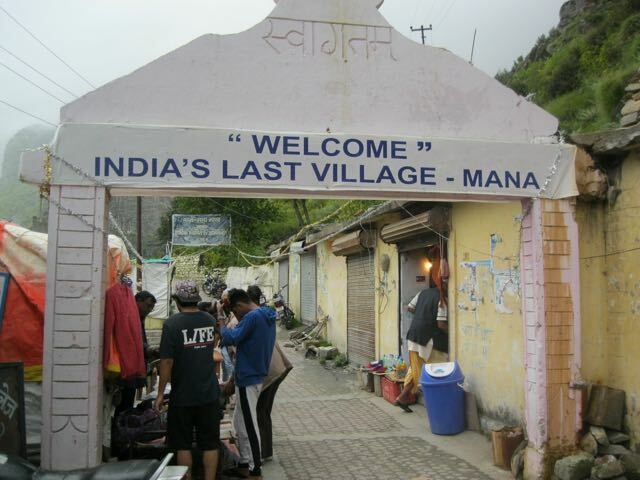 The next destination was Badrinath which was about 22 km away and Mana, the last village before the frontier with China. Soon we hit a landslide area. There was slush on the road and no other vehicles. Rocks were falling down. I drove on but soon stuck in the slush – neither forward nor reverse. By then an army truck showed up. A few army men came out and after taking stock of the situation removed their boots and socks, rolled up their sleeves and pushed me out of the slush. Salute to the Indian Army! A JCB stationed nearby was pressed into service and the slush was removed in no time. Though the soldiers and other drivers wanted us to press on we decided otherwise. And it was a wise decision. Went back to Govindghat and hired an SUV for the journey. Came across a few more landslide areas and a river about a hundred meter wide flowing on the road. 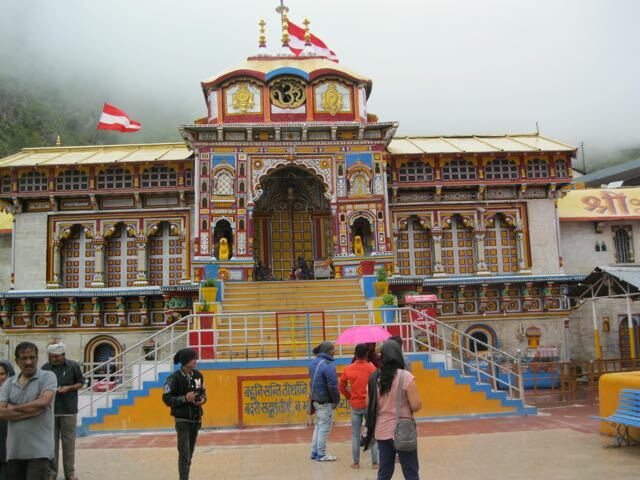 Badrinath was almost deserted being off season. Took our rounds and off we went to Mana. Had a glimpse of the village but decided against walking to the other side where river Saraswati is. It started raining heavily soon and we made good our return. There was strong currents where the river was flowing on the road and so traffic was being controlled. The SUV made it successfully across the water. Our sedan wouldn’t have and we thanked the Almighty. 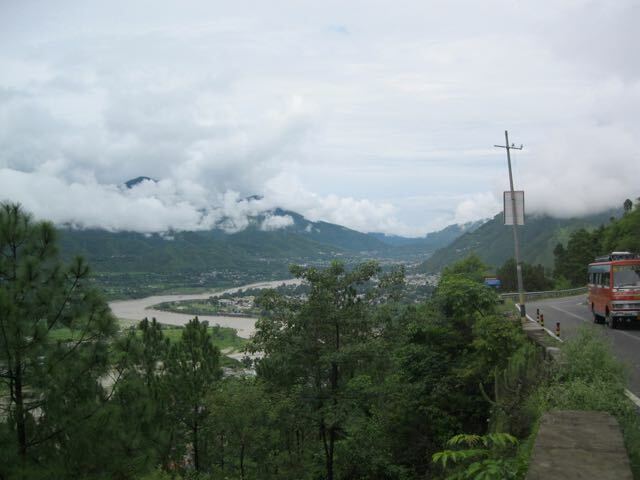 Drove back to GMVN at Joshimath and on to Delhi the following morning this time via Rishikesh. Many landslide spots along the way but were home safely late in the night thus ending the seven-day dream run. 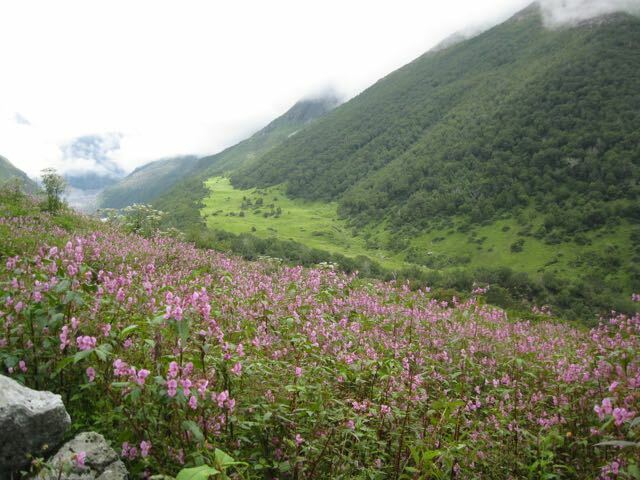 Valley of flowers is kept clean and devoid of plastics. This was as heart-warming as the vista it offered. Kudos to the Forest Dept. of Uttarakhand and the visitors, most of them young professionals from all over the country. 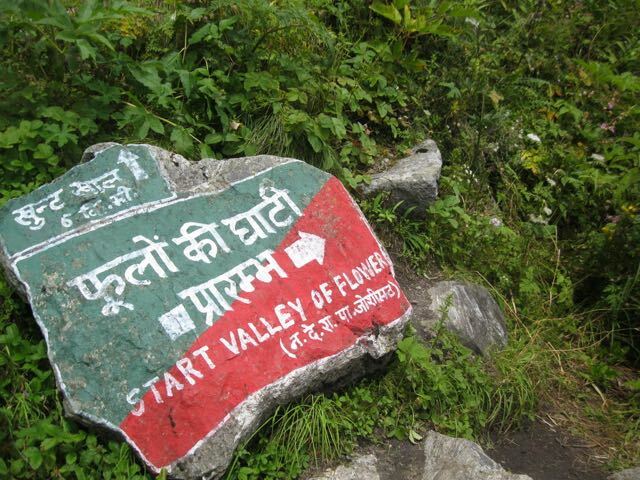 One has to be a nature-lover who cares for the surroundings to undertake this arduous trip just to see a blooming valley. A few of the visitors weren’t enthused with what they witnessed; they perhaps were expecting a manicured city garden with lots of roses, rows of tulips and a bunch of chrysanthemum. Don’t; these are wild flowers in an untended environment. They may be small but their beauty is unmatched. Most of the visitors have similar itinerary as you and so bump into the same people over and over again during the four-day trek. That was fun. Very nicely written. Reminded me on my three trips to this paradise on earth more than a decade ago. Thank you, Harish. Not sure how much this spot is affected due to the floods 5 years back. May not be the core area but the trail must’ve changed. I must honestly compliment Patrick Jones for taking me along with his Valley of Flowers, Hemkund Gurudwara and Badrinath Temple sojourn. Mind you I have missed this part of the Abode of God rightly called Dev Bhoomi Uttrakhand and now age may be against me being 76+, BUT the narrative made me follow Patrick Jones like his shadow and my nostrils throng with the intoxicating smell of wild flowers and stomach acknowledges the langar at Hemkund Sahib or the prasad at Badrinath Temple! When Patrick’s calf muscles ached due to hill climbing fatigue, I felt mine too aching or else how would I request the Uttrakhand Government ,’ Please repair and renovate ‘Legge’s grave’ in the ‘Valley of Flowers’ which is of great historical value and has borne the vagaries of treacherous weather for 80 LONG years! Extremely delighted that I could take a proud soldier all the way up to that wonderful spot, Colonel. Yes, the place is breathtakingly beautiful and feel proud I could be there. I too felt the need to renovate Legge’s grave and so thanks for the initiative. The trail would’ve washed off in the 2013 floods so 2014 wasn’t the ideal time for valley visit. Now that things have improved you’ll surely be able to make it. Glad you enjoyed the goodness of the land. Glad to note we’ve a valley veteran here and I’m sure it would’ve been extremely adventurous in those days. 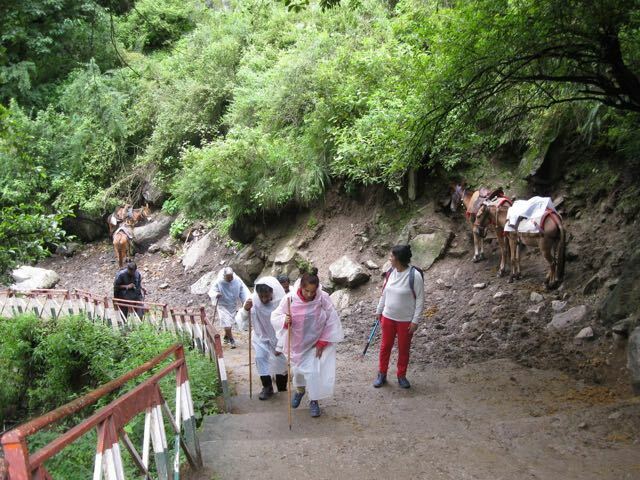 However, as I mentioned in the post, the number of visitors seems to have not affected the ecological balance of the valley as visitors are allowed on the single trail only and I seldom saw litter, the bane of modern world. Hope it remains so. Thank you Patrick for taking us along, without making it look so arduous that you give up and then breeze through the log, as if it is something which is only to be read. Your narration, made me go back a few times so as to read it well and to remember it well..
Never been that side. The most I have been is to Ukhimath (Chamoli). Not enough support I am able to garner from my usual suspects so I guess I should look broader. Yeah, the ‘usual suspects’ doesn’t fit at times especially where lot of physical efforts are involved (they can’t bottle it, that’s another issue). So you must visit even if it causes some raised eyebrows. You are right about the comments; I too miss that golden era where discussion often surpassed the goodness of the story in question. It used to create so much enthusiasm one used to await eagerly for the responses. Well, nothing lasts forever! Great post Sir…all the pics are really very nice…thanks for sharing. Thanks a lot, Arun. Photographs shall never be able to do justice to the place as it tends to grow on all your senses; it has to be experienced. Wow Patrick! What an amazing write-up. Special compliments for using similies like “The lush green hills wore the look of a bride coming out to meet the groom, excited to be with you” and ” I felt like Moses on Mount Sinai, about to meet God” which added that extra touch to your narration. Your story brought back vivid memories of my trek to Himkund Sahib and Valley of flowers around 24 years back. That time there used to a lone Gurudwara at Govindghat from where the trek used to start and the overnight halt was at another gurudwara at Govind-dham (Ghagaria). Most people had to sleep in the open verandah of the Gurudwara (as the limited rooms of the Gurudwara were mostly full) using the blankets provided by the Gurudwara. The last 6 kms till Himkund Sahib were the toughest and at that time it felt like climbing a wall. Anyhow its good that they’ve been able to conserve and preserve the place till now. Look forward to more interesting write ups from you. Phew! Thought for long moments for a reply but just couldn’t get a grip somewhere. You are so gracious with your words, Soma, especially as you’ve been there long back. I can imagine how it would’ve been then – all the more exciting. The place is so fabulous I’m not sure I could do justice to it. Glad you liked the post. Thanks a lot for dropping by. A wonderful write up! I am a good hiker, but trekking is not my cup of tea, so hats off to you! :).Don’t know whether I will be able to make it there in person but your narrative has absolutely held me spellbound and triggered my imagination of that beautiful paradise. Anyone with the desire can do it, Koyela. I have seen really hefty ones doing it albeit slow. Also most of the enthusiasts I met were either from Bangalore or Calcutta. So it won’t be too difficult for you. 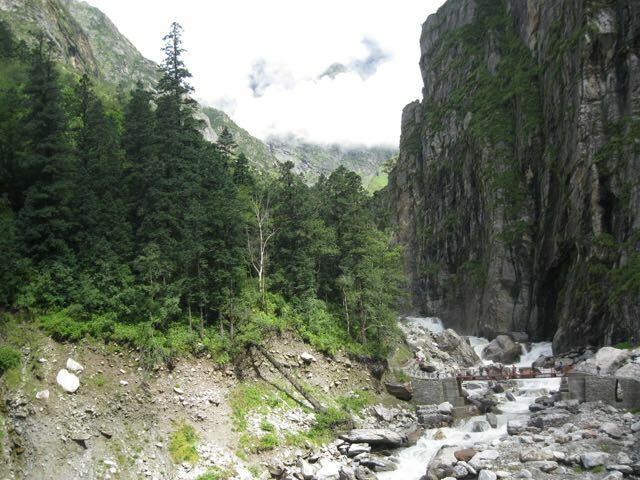 The trek itself is an experience to be immersed in the serenity around. A little preparation would help. 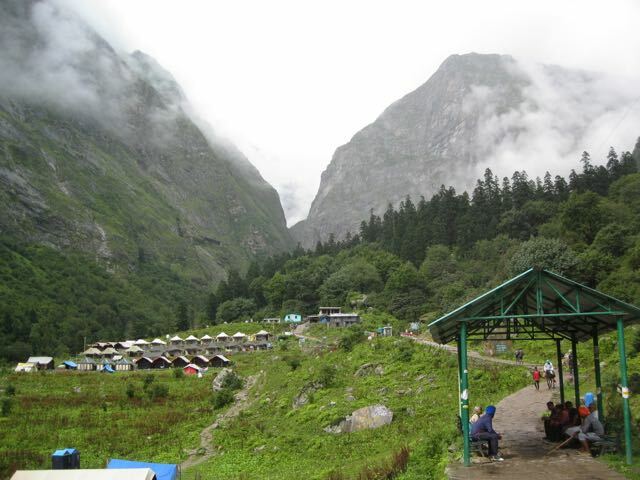 Tucked away in the folds of a mighty mountain this spot is an absolute beauty a nature-lover can’t miss. Thanks a lot for liking the post, Koyela. My mission will be successful if it can make you undertake this trip.